A few of my friends who blog have started sharing freebies on their blog. I want to start doing the same here on my blog. I am going to try to share a freebie every Friday. My goal is to share resources that have been a help to me that I believe will be a help to you as well. Today I have a great freebie to share that will help anyone in church leadership looking for a children’s pastors or are a church leader looking for a children’s pastor position of your own. 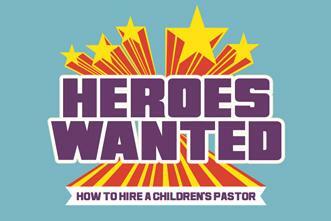 It’s eBooklet provided by KidMin360 called How to Hire a Children’s Pastor by Greg Baird. It seems like in the past few years full-time children’s pastor position for becoming more popular. Unfortunately, a lot of churches struggle with finding someone to bring on full-time to do children’s ministry. A lot of churches hire a youth/children’s pastor or maybe a Christian education pastor that is over all age-specific ministries. A children’s pastor position, in my opinion, is one of the most important positions in church leadership. Other than the lead pastor, I believe the children pastor has the greatest ministry opportunity before them. They get to evangelize and disciple children while they are young and set them on a course of following Jesus for the rest of their lives. I believe this simple eBooklet will help churches in their search for a children’s pastor as well as help anyone who is looking for that position themselves. Feel free to share this eBook with anyone you know who may benefit from it. Click the link below to view the eBook or follow the instructions below to download it. Thanks for the comment. I believe you meant to post your comment on my post about the Juvy Center not on this one about a children’s ministry ebooklet. Either way, thanks for the comment. It sounds like God has given you a heart for those kinds of students and look forward to hearing how God uses you in His ministry. Blessings! Yea, I figured I would start doing some freebie Friday’s here on my blog! Thanks for your freebie’s as well!